The December 2004 Mussel of the Month is Anodonta cygnea, the swan mussel. A. cygnea is one of the most widespread freshwater mussels on earth: it is found from the British and Irish Isles east to Siberia, and south to northern Africa! Linnaean 'type' in the collection of the Linnean Society of London: Conchylia Linnaeana. 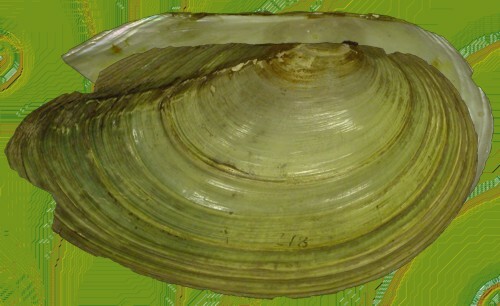 Anodonta cygnea holds the distinction of being one of the first freshwater mussels to be described. Mytilus cygnea, as it was originally called, was described by Linnaeus himself in the 10th edition of Systema Natura, 1758. Anodonta cygnea is also notable because it has been renamed over 500 times! Even Linnaeus, while only introducing four names, hit A. cygnea again under the name Mytilus anatinus. At the time of creating this page, the MUSSELp Database shows 571 available species-group level nomina synonymous with Anodonta cygnea. Follow the links for more information about Over-named freshwater mussels and their Over-namers.